How do you like your steak? Rare? Medium well? Related? In the year 2031, meat is what’s for dinner and just about every other meal. After the Agricultural Meltdown of 2018 destroyed 90% of earth’s farmed produce and rendered most of what remained toxic, vegetables were outlawed. Attempting to grow carrots is now illegal. Eating salad is a misdemeanor. Serving it will get you jail time. While most of the human population adapted to a meat diet, it was hard on vegetarians. And for the animals, it was murder. Methodical mass murder. Factory farming escalated to inconceivable levels of cruelty, making the earlier holocaustic mistreatment of animals look like a walk in the park. And livestock isn’t the only game in town. If the family dog strays too far from home, it’s up for grabs. Extreme inhumanity is rewarded. Animal Rights groups no longer exist. No one steps forward to represent the animals or increase awareness of the torture and carnage. Not if they want to live. After realizing centuries of heart attacks and even deadly bacteria can’t thwart man from his lust for flesh, the animal kingdom will force man’s hand with one last unimaginable strategy—the one thing certain to stop all people from eating animals. What would it take for you to give up meat? It takes a Pigg, Ima Pigg. Demi is a deer now in human form. She has walked into the study of the human girl’s father, Venice McCabre. All her life as a deer, she was immunized against hunters by means of a pink rhinestone collar. Now, for the first time, she sees what’s become of her family and friends. Demi had only been in the study for a very short time, but now, with the same morbid curiosity of passersby who are compelled to observe a ghastly accident she looked upward. Her eyes panned slowly as she took in a panoramic collection of barbarity. Donning that dazzling rhinestone collar may have guaranteed her safety from a hunter’s bullet for the last seventeen years, but it never prepared her to witness the repeated decimation of her family and friends. Frances tried to harden her heart so each time a killing touched too close to home, Demi could make some sense of it and move on with minimal grief. And for the most part, she had become somewhat benumbed. She had released her sorrow over the years—at least, she thought she had. Staring down at her with blind frozen eyes were her relatives. The heads of her aunts, uncles, cousins, siblings, and offspring—even her darling mate—were mounted high on the mahogany walls. They were all so handsome and lifelike that for a brief instant, Demi felt she had stumbled into an unlikely family reunion and in that brief instant, her heart nearly leapt for joy. And then it occurred to her she had—a gruesome get-together of decapitated relations. She couldn’t move. Standing as petrified as the menagerie that canopied her, Demi’s legs felt heavy and immobile. A tingling lightness swelled in her head. She tried to keep calm and while she didn’t cry, her eyes rimmed red. She started to feel faint. Demi took a deep breath to nourish her consciousness and in doing so, inhaled a nauseating mirepoix of cigars, oak and just a touch of formaldehyde. Her single stomach squeezed tightly and she found it nearly impossible to take in air. The more the ghosts closed in on her, the more the room began to spin. Her vision went black around the edges and hindered her sight until there was nothing. Liz is a Florida girl – born and raised in the Sunshine State. Her career path has spanned from physical to fiscal to literary starting in nutrition, then riding the roller coaster we call the stock market as a financial advisor and ultimately penning her first book at age 49. Before meeting her husband and marrying in 1992 Liz lived in New York City and Los Angeles. In 1995 she had a child but fear and impatience with unpredictable earthquakes in California motivated her to move back to Florida in 1999 – just in time for that y2k scare…. Liz’ debut novel “Who Got Liz Gardner” was published in April 2009 as the result of an international contest and is now enjoying tremendous popularity in book clubs around the world. Recently, some critics have called her novel “the intelligent and better-written ‘Fifty Shades of Grey'”. She was also reviewed and highly recommended by USA Today in April 2012. The sequel to WGLG – Discovering Arugula – was released January 2011. She recently released her third novel “Ima Pigg” a young adult/scifi tale which has been described as “Charlotte’s Web” meets “Invasion of the Body Snatchers”. 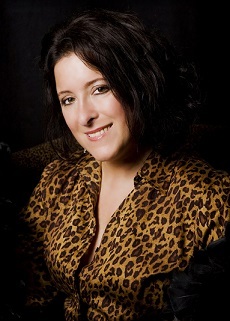 Liz has been a contributing writer for several women’s magazines as well as a popular speaker for women’s groups. Liz lives with her husband, daughter and Catahoula Leopard dog. Her unrealized dream is to ride horseback across the fields of Provence for one week. In the meantime, she rides dressage once a week and goes to Epcot. She will not ride Mission Space. She does, however,practice her high school French when she orders crepes. Links to ELIZABETH’s website, blog, books, etc. 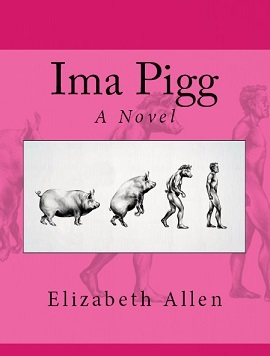 **SPECIAL ANNOUNCEMENT: Elizabeth will give away a FREE Kindle version of her release, IMA PIGG, to one of her lucky readers who comments on either her Monday Interview or Wednesday Book Bench blogs!! Winner will be randomly selected and announced Monday, July 15, 2013. Thanks, Elizabeth, for sharing your stories with us!